Back in October, I signed up for the beautiful Rosie's blogger book swap. It went really well, I was paired up with Liz and she sent me a lovely parcel of books, which I thoroughly enjoyed. Having got this year's 52 in 52 challenge off to a cracking start, as well, I've been spring cleaning and seem to have built up quite the little pile of books I've enjoyed reading, but probably won't again, and I wondered if anyone else had these as well. And if so, whether you'd like to swap, with like-minded readers? 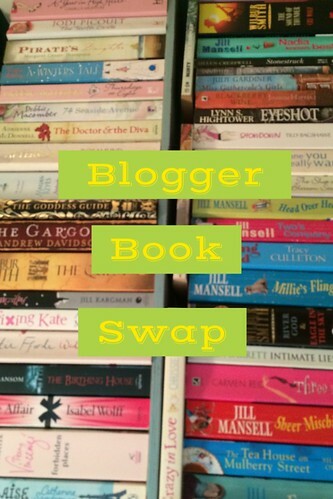 If you fancy taking part in my #bloggerbookswap, just either leave me a comment on this post with your name and email address, and anything your swapper should know (likes, dislikes, favourite authors) or send that info to me in an email (my email address is on my sidebar). Please send this over to me by Easter Monday (21st April). I'll match people up based on the information they give me, and send out emails with who you need to send to by the end of that week. Then, you'll need to contact your partner for their postal address, and put a parcel together for them. I'm not suggesting you go out and buy brand new books for them (unless you don't wish to part with any of your own books or particularly want to). I'd hope that your parcels would contain a couple of books, and maybe a little note to your partner about why you chose them, and anything else you'd like. Then, send them on their way, by the posting deadline of Wednesday, 30th April. Let me know when you've posted your parcels so I can tick them off. Then, sit back and wait for your parcel to arrive, and get stuck in. It would be lovely to see some posts about the books you received; I love a good book review! If you'd like to spread the word about the swap, feel free to do so and I'm more than happy for you to use this image, link to the post, etc. The more, the merrier! Hi, this is a great idea, I love sharing book-love like this. I don't know if it would be okay for me to signup since I live in Denmark? If so, please let me know and I'm up for a swap! Hi, I've emailed you - yes, you can certainly take part! Yay! i love all sorts of books - dont often read chicklit though. Hi, Char, I'd love to do this. I like all books apart from those child abuse ones (A Child called It or some such similar) or factual books. I like me a good fiction book, anything fantasy, chick lit, as long as it's a good story line. I am so in on this! I love getting new books to read and sending on some of my favourites!